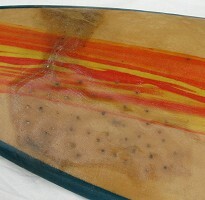 1970 Keyo Standard 6 ft 1/2"
Stringerless foam blank, laminated tint and squeegeed colours, fin box (no fin). Nose: rounded, but squared after repairs. * 1'' has ben added to the actual current length. Highly unusal box with cross beams. Deck: Clear with blue rail lap and orange/yellow squegeed stripe. Bottom: Blue laminated tint with green squegeed stripe. Board added to surfresearch collection February 2008. Item collected from Loftus, NSW with no previous history. Extensive repairs in a variety of methods - note squared off nose (image left) and multiple drill holes with resin filling in the deck, image below. Several manufacxtures of this period produed Standard models, usually a sub 6 ft economy model often characterized by marble gel coat and inserted fin with no rovings. The blanks were blown very close to the finished shape and only required minimal shaping. Since this retained much of the high density outer core, the construction method was very strong and many surviving examples are in excellent condition. #541971 Farrelly Pop out 5ft 5"
in the deck, on the right hand rail.